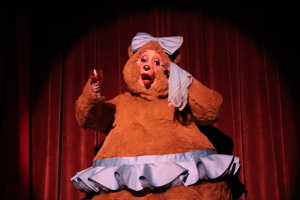 Yesterday we went to the Magic Kingdom to see the last shows of Country Bear Jamboree before it went down for refurbishment. 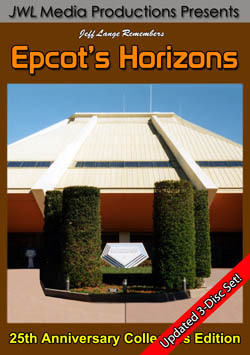 There is talk that several minutes might get cut from the show, so we wanted to make sure to capture it in photos and video just in case. 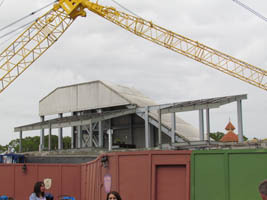 But first, we took a look at New Fantasyland progress, and found that the sign for the Be Our Guest Restaurant is now up! 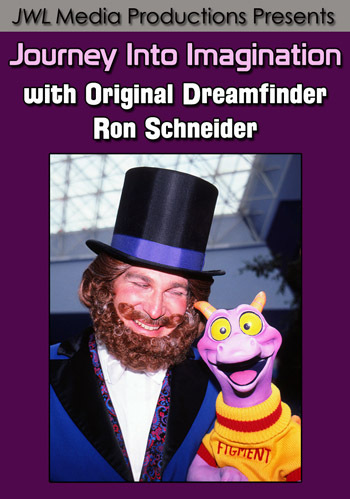 Behind it appears to be a griffin (below, left). 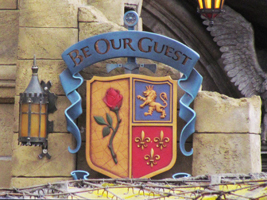 The Be Our Guest sign (below, right) features a rose and several symbols. 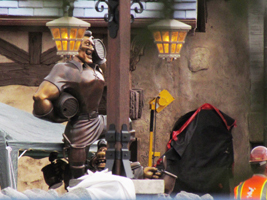 The Gaston and LeFou fountain is harder to spot now that new lighting fixtures are up (below, left). 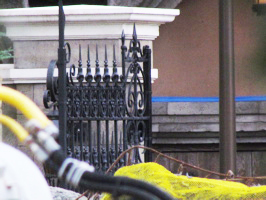 And this fence sits near the entrance to the Be Our Guest Restaurant (below, right). 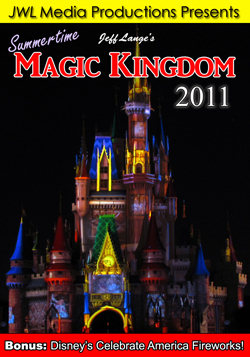 Be Our Guest Restaurant opened up for bookings this past week, and quickly sold out most of this year’s reservations. 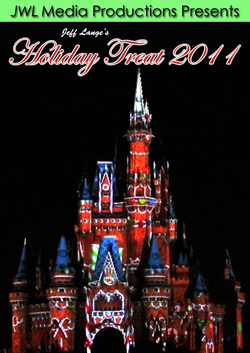 Video #1 – Be Our Guest Restaurant Sign – New Fantasyland Enchanted Forest, Magic Kingdom, Walt Disney World – The sign and entrance of Be Our Guest Restaurant in the Enchanted Forest section of New Fantasyland! 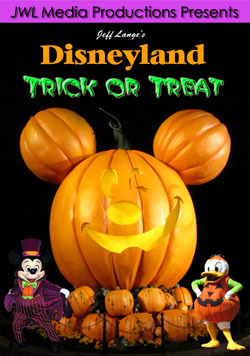 Reservations started being accepted to Be Our Guest August 20th for November 19th and beyond. 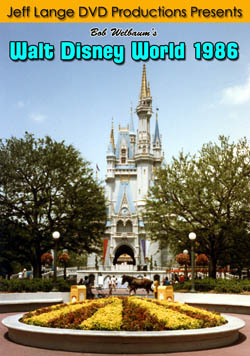 This is the Magic Kingdom at Walk Disney World. 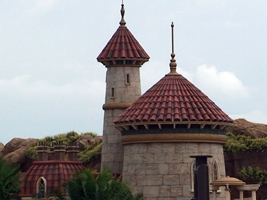 Prince Eric’s Castle (below, left) can be seen – barely now (below, left). Rain clouds (below, right) threaten behind the castle walls. 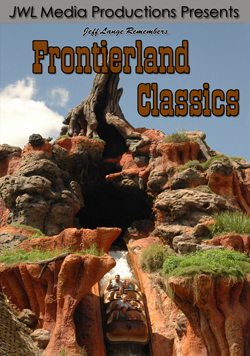 Video #2 – Fantasyland Construction 8/21/12 Disney World – Be Our Guest, Enchanted Forest Entrance, Mermaid – It’s just a few months until the new Fantasyland opens up to guests! 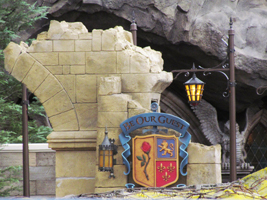 Here is a look at Be Our Guest Restaurant, the entrance to the new Fantasyland near the Carousel, Little Mermaid/Prince Eric’s Castle and more! 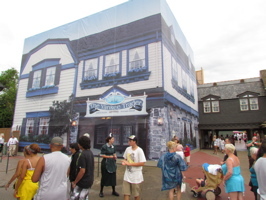 The Yankee Trader (below, left) is behind a giant scrim as work in this area continues. 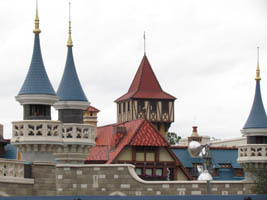 In the location of the former Fantasyland Skyway Station (below, right), new restrooms are being built – as should a Tangled Tower. 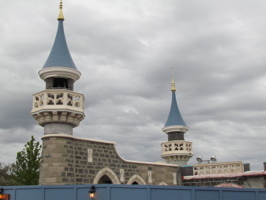 Video #3 – Fantasyland Former Skyway Station Area Construction – Restrooms, Tangled Themed Tower – Here is a look at construction at the former Fantasyland Skyway Station! 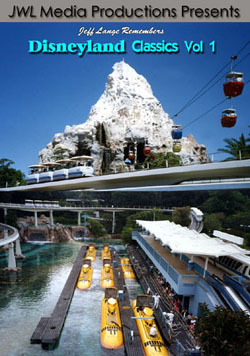 This area is set to become bathrooms and have a Tangled themed Tower. 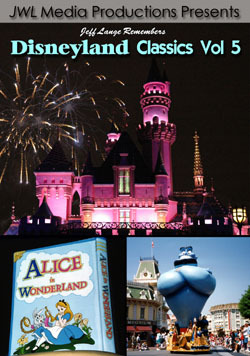 We enjoyed 4 showings of the Country Bear Jamboree with friends (below, left). 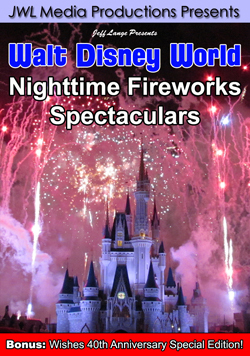 There was a small crowd for the final show, which started at 9pm. 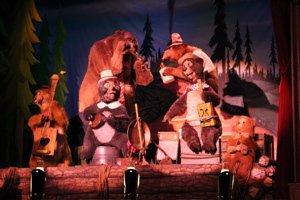 Wendell (below, right) sings a song in front of the city park that is rumored to be cut “Mama Don’t Whip Little Buford”. 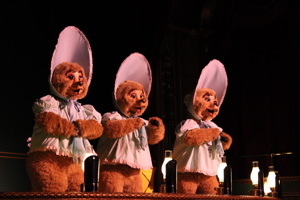 Bonnie, Bubbles and Beulah make up the Sun Bonnets, who sing the sad song, “All The Guys That Turn Me On Turn Me Down”. 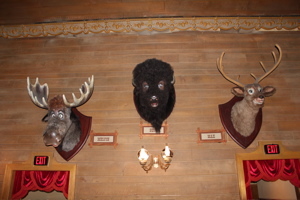 Trixie (below, right) seems tearful that changes might be made to the Country Bear Jamboree. 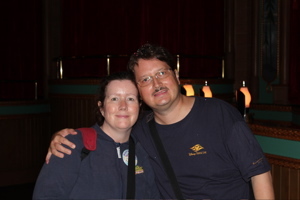 Denise and I (below, left) enjoyed watching the last Country Bear Jamboree before refurbishment, though I think she was pretty much done after 4 showings! 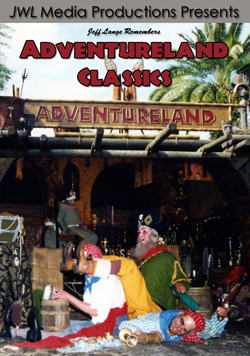 Melvin, Max and Buff provide some comic relief during the show (below, right). 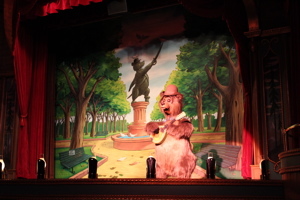 Video #4 – Country Bear Jamboree Final Show Before Refurbishment 8/21/12 Devilish Mary Clip Disney World – The Country Bear Jamboree went down for refurbishment today. 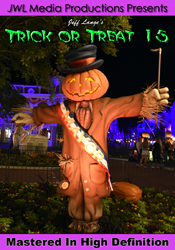 This clip of Devilish Mary was shot last night at 9pm before it closed for 2 months! 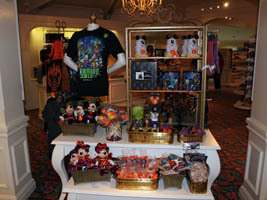 Halloween merchandise (below, left) is now appearing at the parks and resorts. 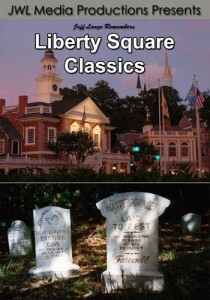 I have my eye on this set of 3 small tombstones in a pack (below, right). 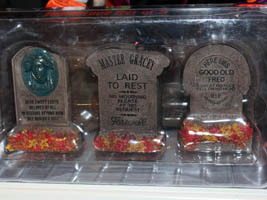 It includes Master Gracey and Leota! 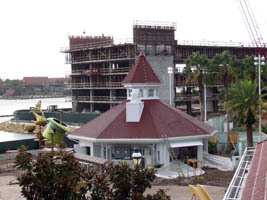 At Disney’s Grand Floridian Resort, the Alice in Wonderland themed water activity area is supposed to open next week (below, left). 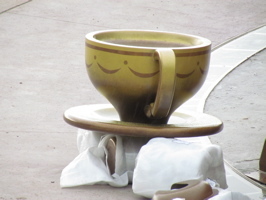 A teacup sits on the ground (below, right). 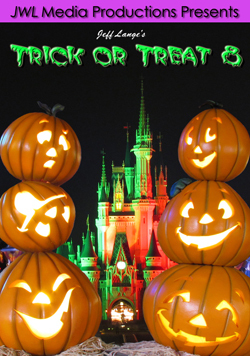 In the first photo, there is also a Beach Pool Bar that is scheduled to open on August 24th, as Gasparilla Grill & Games goes down for refurbishment through December 17th. 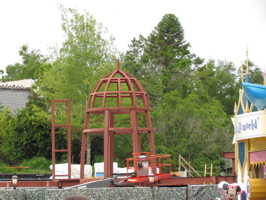 A giant Mad Hatter hat is ready for water, providing the “bucket” in this play area (below, left). 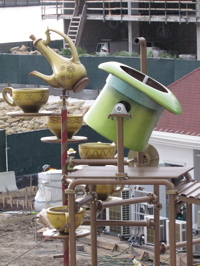 A teapot also is ready to pour water into a cup. 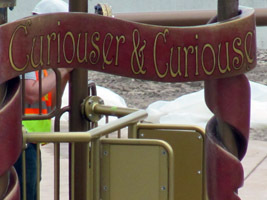 “Curiouser and Curiouser” says this sign (below, right). 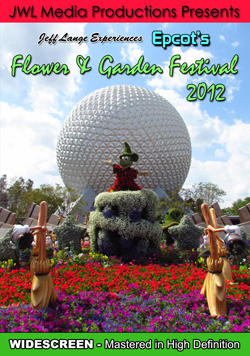 Video #5 – Disney’s Grand Floridian Resort- Alice in Wonderland Themed Water Playground, DVC Villa Construction – Here is a look at the Grand Floridian Resort DVC Villa construction, including a new water play area themed to Alice in Wonderland! Behind it is a quick-service restaurant that should be open this month.